"Eighty million miles off course. If they're alive on board that craft, they must be in a pretty bad way!" 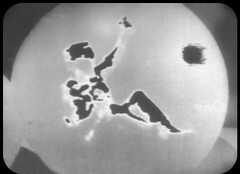 The space station aims the X-Ray laser at the Silver Carrier. Jamie signals to the space station using the Time Vector Generator alerting them to their presence on the ship. Two crew members travel over to the ship. The station crew are detecting odd magnetic effects and sudden drops in air pressure. 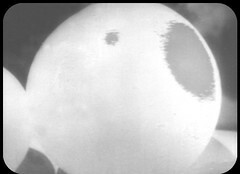 Unobserved egg like bubbles are attaching themselves to the hull. Jamie has been checked by the station's Doctor, Gemma Corwin. 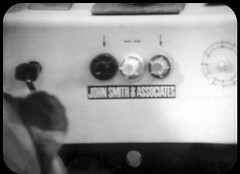 When asked for the Doctor's name he says John Smith, taking his inspiration from a box he can see. He is unable to explain why they were on the Silver Carrier. He is introduced to Zoe who has been instructed to observe him. 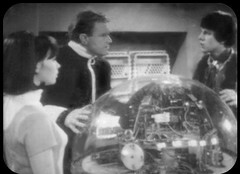 Jamie is given a tour of the station and slips away intent on sabotaging the X-Ray laser so they can't destroy the Silver Carrier and the Tardis. 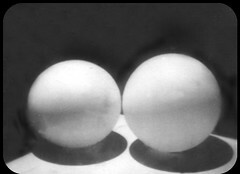 On the Silver Carrier, two white sphere start to glow, becoming translucent, exposing something moving inside which punctures the skin of the sphere with a 3 fingered silver fist! This episode was just as boring as the first one, slow moving and boring. It's not even got Patrick Troughton in it: he's away on holiday again, 12 weeks after his Web of Fear 2 absence, so while he's gone fishing the Doctor lies unconscious on a bed. But here it almost feels like the slow boring episode has a purpose: it's showing the mundanity of space travel, trying to present a realistic version of the future. 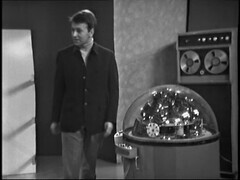 At the point this was made in 1968 the race to the moon was very much on so Space Travel was a thin and you could see Doctor Who and Kit Pedler wanting to present a realistic, if future, vision of it. 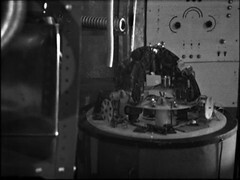 There's several stories over the next year showing versions of Space Travel with it featuring in both Seeds of Death and The Space Pirates as well as forming a central theme of David Whitaker's next, troubled, Doctor Who story The Ambassadors of Death, which he will be attempting to write during this period. The Time Vector Generator is being used as a bit like the modern Sonic Screwdriver, which is now as a do all device. So far this story it's assisted with immobilising robot and signalling station as well as helping to provide a good reason to get the Doctor out the Tardis. JAMIE: How about the medical? Do I pass? CORWYN: You'll do. If it's any comfort to you, you are in fine physical shape. Can you give me your full name please? 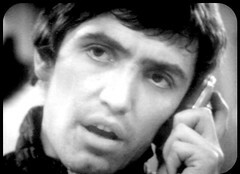 JAMIE: James Robert McCrimmon. Jamie. CORWYN: Thank you. And your friend? CORWYN: I can't put that down. CORWYN: Would you like to see over the Wheel? I could arrange it for you, if you like. JAMIE: Oh, yes. I mean, there's nothing else to do. CORWYN: Well, if you go along the corridor you'll see a door marked Parapsychology library. CORWYN: It's on the other side of the Wheel complex, about eight sections on. I'll tell Zoe to show you round. CORWYN: She's our. Well, the best way to describe her would be to call her our librarian. 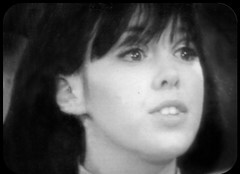 We do get to meet new companion Zoe for the first time though, played by Wendy Padbury. Her most major TV role up to this point had been playing Stevie Harris in the first 44 episodes of Crossroads. ZOE: Parapsychology library. What reference do you require, Doctor Corwyn? CORWYN: No reference, thank you, Zoe. I need your help in another way. CORWYN: One of the people retrieved from the rogue spaceship is coming to your section. I'd like you to show him over the Wheel and observe him. ZOE: Do you want these observations recorded? ZOE: Hmm, should be interesting. JAMIE: What are you laughing at? ZOE: Your clothes. You're wearing female garments. JAMIE: Female? Look, I'll have you know this is a kilt. Have you not seen it before? ZOE: Kilt? Kilt. A barbaric form of garment as worn by a kiltie! Are you of Scandinavian origin? Danish? ZOE: Oh, a Scot. Scotland, of course. Pre-century history isn't my field, you see. JAMIE: Aye, maybe not, but just you watch your lip or I'll put you across my knee and larrup you. ZOE: Oh, this is going to be fun. I shall learn a lot from you. 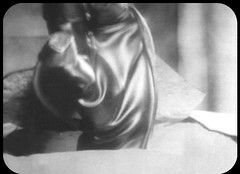 Come on, James Robert McCrimmon. Do you know anything about interstellar flora? DUGGAN: And this is the capacitator bank for the x-ray lasers. DUGGAN: Oh, it controls the laser gun. Without it the gun's useless. JAMIE: What do you need a gun for up in space anyway? Jamie! How long have you been travelling with the Doctor for? Given the number of menaces he's faced with the Doctor it's a rather stupid question! This odd shaped device previously appeared in The Space Museum & The War Machines and will return in The Mind Robber and Spearhead from Space. Apparently it was originally constructed for the film the Curse of the Fly. It's not the only returning Doctor Who prop in this story to have come from a film either. Wheel in space is somewhat unusual for having three significant roles for female characters in it. In addition to Wendy Padbury's Zoe we have Clare Jenkins, playing Tanya Lernov, who previously appeared as was Nanina in the Savages and will reprise her role as Tanya in the final episode of The War Games. The Wheel's medical doctor, Gemma Corwyn is played by Anne Ridler. 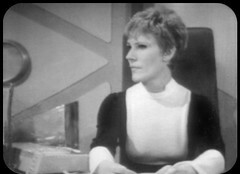 She'll later feature in Moonbase 3: Achilles Heel as Prof. Kate Weyman and The Tomorrow People: The Revenge of Jedikiah: Curse of the Mummy's Tomb as Professor Johnston but she's probably best known as one of the voice artists on Terrahawks where she provides he voices for Kate Kestrel & Cy-Star as well as the female voice It-Star. 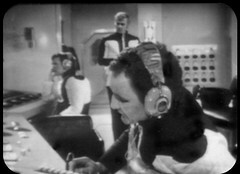 Donald Sumpter , appearing as Enrico Casili, would go on to play Commander Ridgeway in the Third Doctor story, The Sea Devils. If you ignore his role in the spin off Sarah Jane Adventures as Erasmus Darkening in The Eternity Trap then his appearance as The President in the Doctor Who episode Hell Bent probably makes the longest period, 42 years, between Doctor Who appearances. 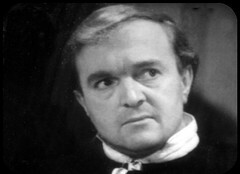 He can be also found in Dennis Potter's last television story, Cold Lazarus, as Dr. Rawl. Eric Flynn plays Leo Ryan. 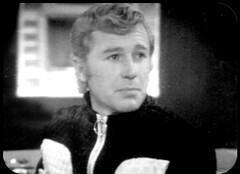 He was in the missing first season Out of the Unknown episode The Fox and the Forest as Faber. There are some more identifiable crew members but I can't find them in the telesnaps for this episode: we'll come to them later. And it's the end of a 13 episode run without anything to watch. The last episode that exists was Web of Fear 1. We're missing Web of Fear 2-5, Fury from the Deep 1-6 and Wheel in Space 1 & 2. Of course since then Web of Fear 2 and 4-6 have been returned taking the gap down to 8 episodes, the second largest now existing after the 12 missing from after Tenth Planet 3 to before Underwater Menace 2. That six episode gap doesn't seem quite so bad thanks to what survives of Fury from the Deep courtesy of the Australian censor.